In just a few weeks from now, Salford's The White Hotel will host a night of leftfield and particularly out-there music taking in live sets from the likes of Bourbonese Qualk's Simon Crab, Pale Master and Woven Skull. The organisers of the party, which takes place on November 4, promise a night of "music, art, visuals, mischief, and ink, to make you think more", with live body art set to be provided by Brindle's Messiah, while a number of live visual artists have been lined up to provide suitable accompaniment to those playing music on the night. 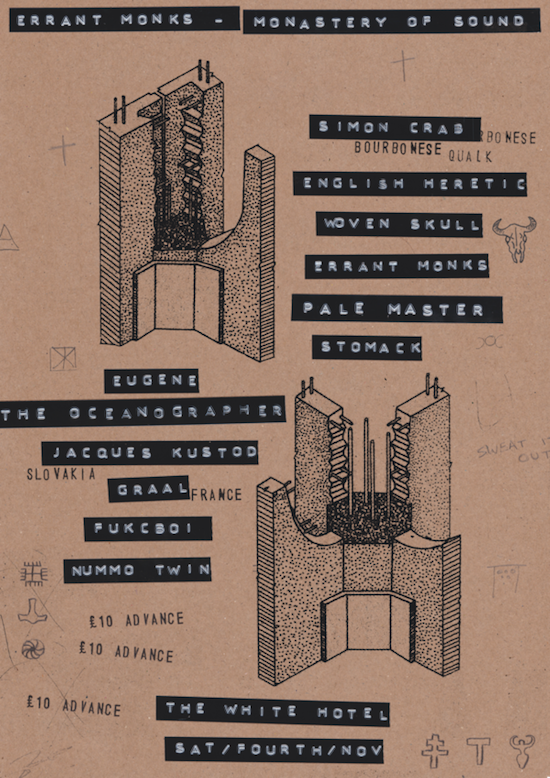 Completing the bill are the likes of English Heretic, Eugene The Oceanographer, Graal, Jacques Kustod, Stomack, Fukcboi, Nummo Twin and Errant Monks, who are set to release an album next year via Tesla tapes and will host the party which is being billed as 'The Monastery of Sound'. Tickets are on sale now, and £1 from every ticket after the first 100 sold will be donated to us here at tQ in a very kind gesture by the party's organisers. You can find out more information here and get tickets here.